Dr. Dahlkemper has advanced training and participate in many hours of post graduate study pertaining to orthodontics and invisible braces. 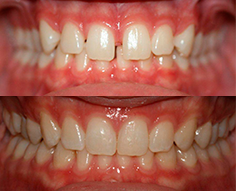 With new techniques, some orthodontic cases can be completed in as little as 6 months. Some orthodontic cases will need traditional braces, but with modern technology Invisalign is able to transform smiles in months without braces. Orthodontics is changing and more patients are finding that braces are not just meant for children. Invisalign gradually moves your teeth through a series of custom made, removable, nearly invisible Aligners. Your “bite”. Malocclusion can cause problems with eating, speech, and the jaw joint. Straightening the teeth may be used to improve total mouth function. Tooth support. Orthodontics reposition the teeth above and below the gum line. A strong root foundation helps create a strong tooth. Appearance. The esthetic appeal of a straight smile is one of the primary reasons many teens and adults undergo orthodontic treatment. Oral hygiene. Straight, well-aligned teeth provide fewer “nooks & crannies” for cavities to develop and for plaque and tartar to build up. Brushing and flossing is more effective and oral hygiene is easier to maintain. Invisalign is a system of straightening teeth without the use of conventional braces. A series of clear plastic aligners are utilized to create tooth movement. Moving teeth with removable aligners is not new. However, the computer program, which can generate a series of aligners with small changes, is the new part. Invisalign is recommended for orthodontic situations with mild to moderate spacing or crowding. They are virtually undetectable, easy to use and comfortable to wear. While Invisalign can be used with virtually any treatment philosophy, special training is needed. Dr. Dahlkemper has attended and completed specialized instructional sessions to become a trained Invisalign provider in order to identify and treat the ideal orthodontic cases that can be handled with clear aligners. Invisalign aligners are practically clear. No one may even notice that you’re wearing them; making Invisalign a seamless fit with your lifestyle and day-to-day interactions with others. Invisalign is removable. Unlike braces, you have the flexibility to eat and drink what you want during treatment by simply removing the aligners. And you can also remove the aligners to brush and floss as you normally would to maintain fresh breath and good oral hygiene. Unlike braces, there are no metal brackets or wires with the Invisalign system that could cause irritation to your mouth. The treatment may require building small temporary acrylic attachments on the sides of some teeth to allow for better tooth movement. Plus, since your office visits during treatment don’t involve metal or wire adjustments, your appointments are much shorter! And, finally, Invisalign allows you to view your virtual results and treatment plan before you start treatment, so you can see how your straight teeth will look after your treatment is complete. Modifications in the results can be made even before treatment begins. Are you ready to take the next step into getting a straighter brighter smile? Then call or contact the office of Water’s Edge Family and Cosmetic Dentistry for your complimentary Invisalign consult.